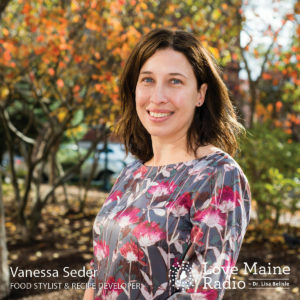 Vanessa Seder is a chef, food stylist, recipe developer, teacher, author, and founding member of Relish&Co., a Portland-based culinary design collaborative. Her new book, Secret Sauces (Kyle Books), was published in autumn of 2017. A graduate of the Institute of Culinary Education, Vanessa has developed recipes for Ladies Home Journal, Real Simple, All You, Health, Cooking Light, and Hannaford’s Fresh. Previously an associate food editor at Ladies Home Journal, Vanessa has also worked as a food stylist for television, video, magazines, and books, including Real Maine Food (Rizzoli), the Apple Cookbook (Storey Publishing), and Berries (Gibbs Smith), as well as for national brands such as Perdue, Barney Butter, and Coleman’s Mustard. She is also a regular culinary instructor at the Stonewall Kitchen Headquarters in York. She lives with her husband, daughter, and cat in Portland.